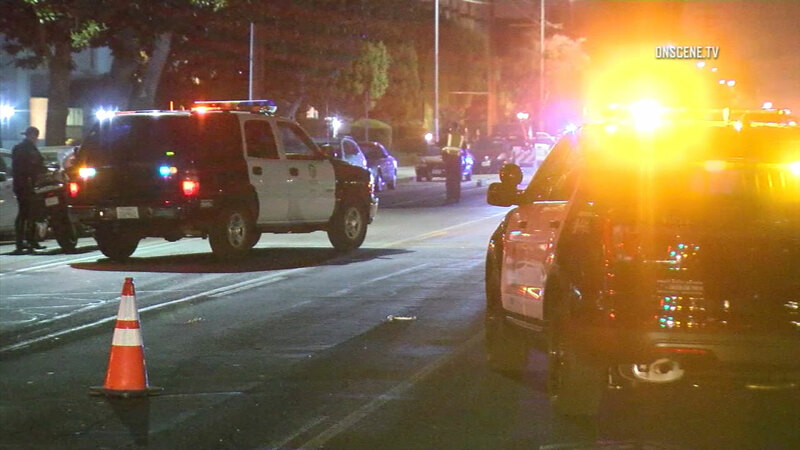 STUDIO CITY, LOS ANGELES (KABC) -- The search continued Sunday for a hit-and-run driver who fatally struck a 65-year-old pedestrian in Studio City. The crash happened shortly before 7:30 pm. Friday in the 12800 block of Moorpark Street, where a man was crossing the roadway in mid-block, according to the Los Angeles Police Department's Valley Traffic Division. After the collision, the driver fled the scene without stopping to help the victim, the LAPD said in a statement. The critically injured man was transported to a hospital; the police department announced his death Sunday afternoon. His name was not immediately released. Some residents say roads in the area are particularly hazardous due to speeding motorists. Chris Johnson said he has often seen "cars coming down here at like 90 miles an hour." "It's never-ending, it's constant. I call it 'Coldwater speedway," Johnson said, referring to nearby Coldwater Canyon Avenue. The hit-and-run vehicle, which likely has front-end damage, is described as a gold 1988 Saturn Ion four-door sedan with California license plate No. 6HAY595, according to investigators. Anyone with information about the crash is asked to call LAPD Detective Daniel Menesez (818) 644-8028 or Detective William Bustos at (818) 644-8021.